I’ve played a few great racing games on Android such as Asphalt or Bang Bang Racing but this new game shown below looks incredible. From the popular game developers Invictus Games comes a brand new racing game for Android, and that other popular mobile platform I wont mention. Just looking at the screenshots has me excited already. With stunning graphics and awesome real-life cars I can’t wait to try it. Hopefully they have an NVIDIA Tegra HD version in the works. 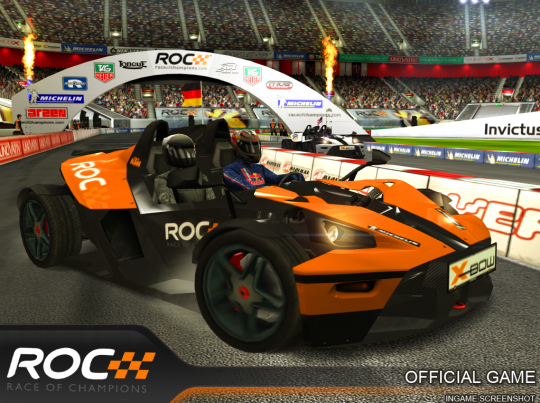 Race of Champions is a yearly event and Invictus has built this game to release right along with the annual race this year, taking place in Germany. ROC is like the X-Games with cars instead of skateboards, brings the best drivers from around the world with all types of styles and races to one huge event. We are hearing the screenshots above while actual game footage come from an iPad, so most likely the graphics will look even better once this game hits for our NVIDIA Tegra 2 powered Android tablets. Just like the actual racing event each year, Race Of Champions the game will include off-road, drag, and circuit racing. As well as various other types and challenges for drivers and their elite skills. We are hearing the game will support cross platform multiplayer so we may end up being able to race against some of those iDevice wielding drivers and our friends. According to the official Invictus ROC webpage we should be seeing Race of Champions sometime in October or early November well before the actual event kicks off later this year. Race of Champions should be available on both Android in the Android Market, and iOS within the next few weeks and we’ll be sure to get some hands-on time and report our findings — I can’t wait to give this game a spin. A few more screenshots and their official video are below.